Getting a Head Start on the “End of the World”! 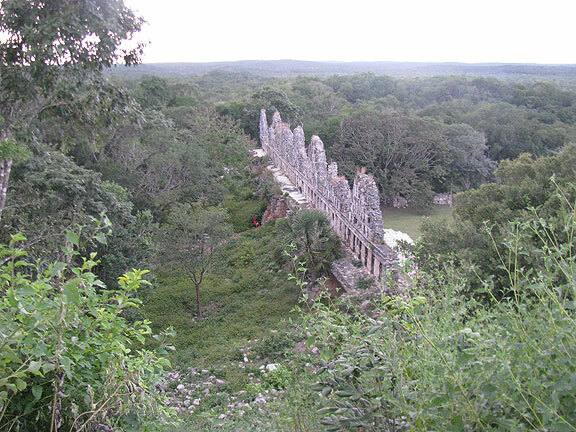 This vast structure is in Sayil, south of Uxmal, a lesser known/visited Mayan ruin. 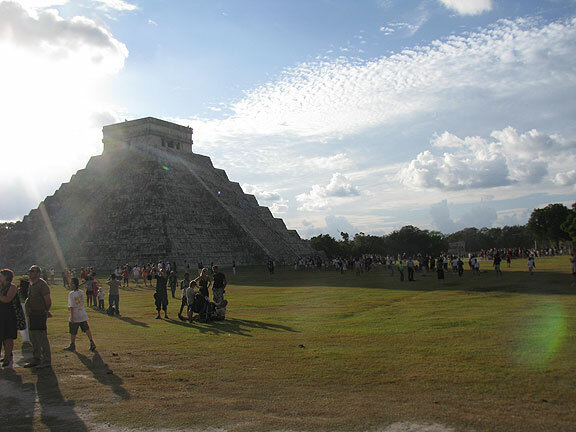 There’s a lot of funny hype about how the Mayan calendar predicts the end of the world in 2012, so we found ourselves going to Yucatan state in Mexico for New Year’s, and laughed that we were getting a head start on the end of the world!. What a beautiful place! 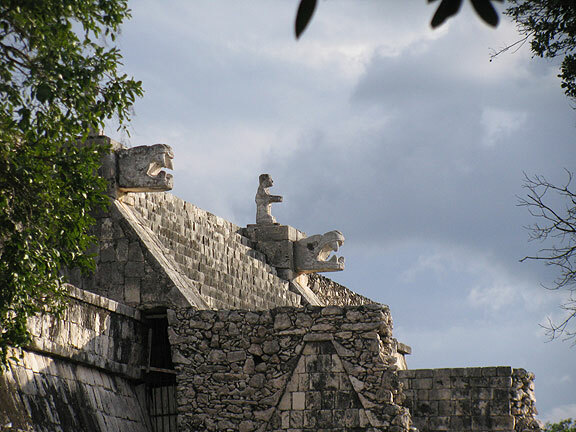 And once upon a time, densely populated by urbanized Mayans, who lived in cities dependent on complicated water capture and storage schemes, with stunning temples and massive stone buildings covered in ornate sculpted hieroglyphs that tell stories of battles, kings, and conflicts of various types. 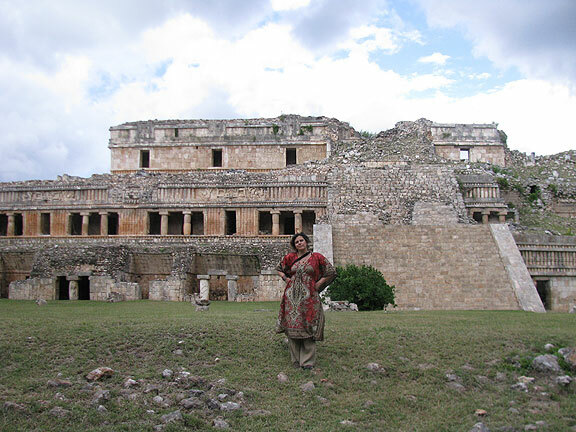 We visited five different archeological sites, including world famous Uxmal and Chichen-Itza, and the lesser known Labna, Sayil, and Ek-Balam (the latter is also the name of a large undersea oil deposit in the Gulf of Mexico). 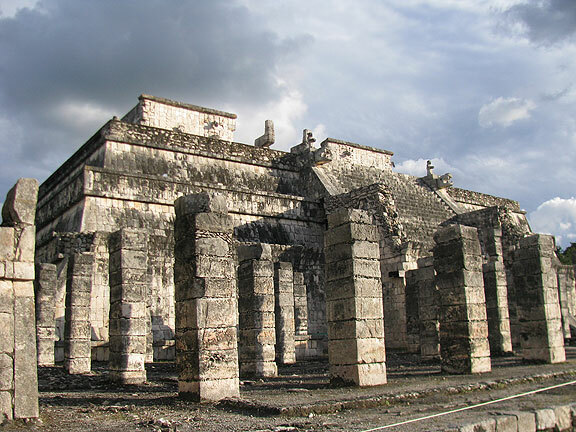 We learned about Sac-Bé, the name given extensive “white roads” that connected the many Mayan towns and cities from the Yucatan down into Central America, rivaling the roads of the Incas in Peru/Ecuador/Bolivia, and the Roman roads across Europe. 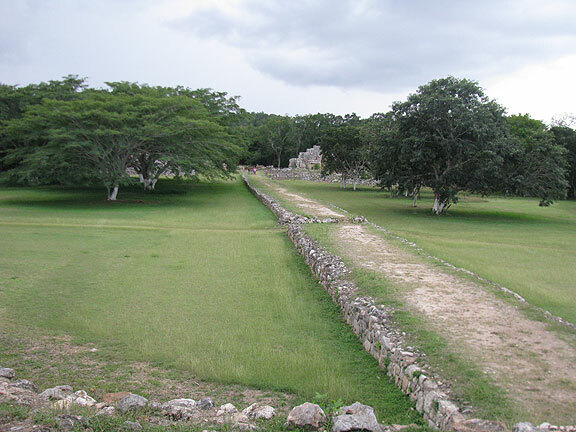 One of the Mayan roads that cut across the Labna ruins, south of Uxmal. This iconic arch at Labna is used in a lot of tourist promotions. In a book called "The Lost Cities of the Mayans" I saw an image drawn in the 1840s of the same arch as it was just being dug out of deep jungle and soil. The North palace at Labna. We landed in Merida, the state capitol, a smallish city of about 800,000, where we took a quick tour of the historic center on our first night. We walked through the city founder’s elegant mansion with soaring ceilings, antique furniture, and huge paintings and sculptures. The colonial architecture is quite charming, and much of the city center has been restored to enhance its appeal to tourism. A local chocolate cooperative has a small shop where they sell outstanding chocolate (our hosts explained that a Belgian chocolate maker had teamed up some years ago with local cocoa farmers to establish the excellent product line). Of course no visit is complete without an accidental encounter with local bicyclists! We were driving home from the center of Merida on the first night in town and went by a guy on his bike with a bullhorn over his shoulder. Moments later as we approached the big central monument in the middle of a major traffic circle we saw a couple of dozen cyclists waiting on the steps and voila! We knew there was a night ride assembling, maybe a Critical Mass? 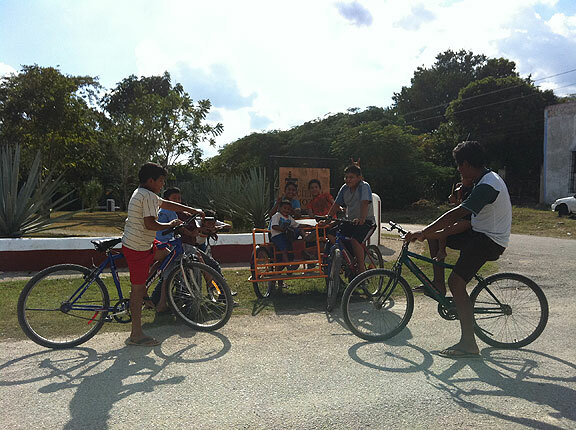 They called it and their group “Cicloturixes,” which means cycling dragonflies in the neologism of Spanish and Mayan. We weren’t able to hang out, but we did meet with them a few days later, and had a fun time telling stories, and thinking about the politics of bicycling in Yucatan with them. 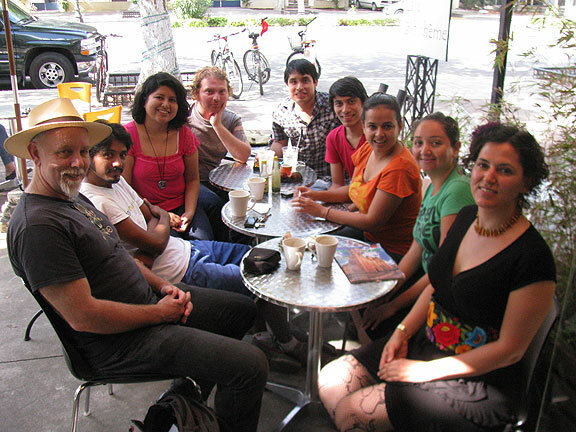 Meeting with Cicloturixes in Merida, December 31, 2011. 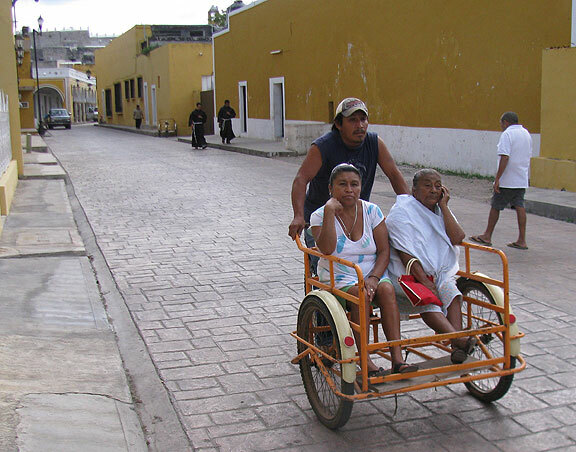 Helpfully for the Cicloturixes is the fact that in most of the small towns in Yucatan the bicycle is still a major form of transportation. We were driving around to see ruins and other sights, and couldn’t help but notice how common the freight bikes are everywhere, on main roads as well as in small villages. Kids were on bikes, adults rode with machetes hanging off their hips while cycling, and freight bikes were ubiquitous, used for everything from pedicabs to hauling goods. In various places there were ciclopistas being built, too, and very occasionally they already has separate bikeways along major highways. The heat in Yucatan is really extreme for much of the year (not bad at all during our New Year’s visit) so canopies are essential. 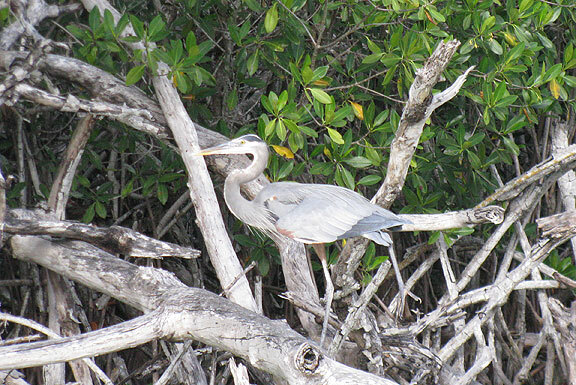 Here’s a small gallery of various bikes we saw in Oxkutzkab, Izamal, and other Yucatan places. 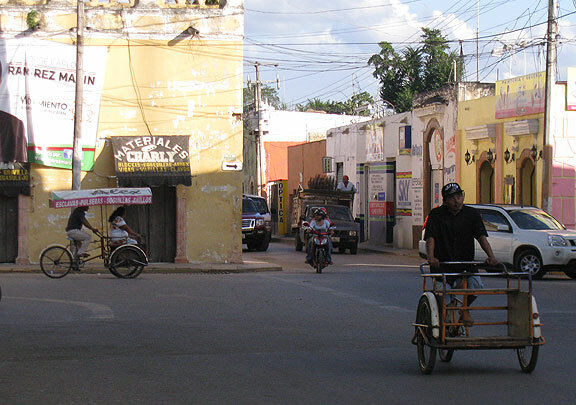 Cycle taxis in Oxkutzkab, Yucatan. 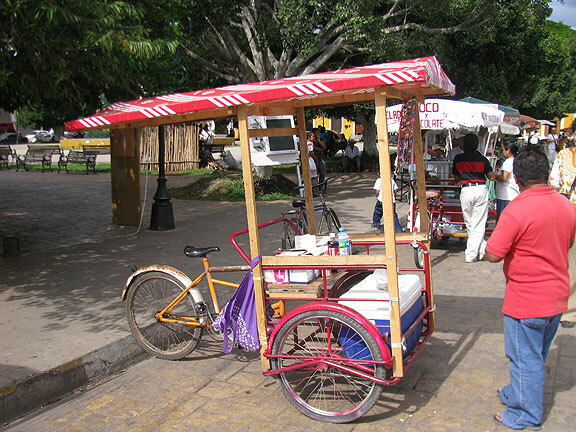 Nice custom job on this vendor's bike, particularly the canopy, in Izamal. 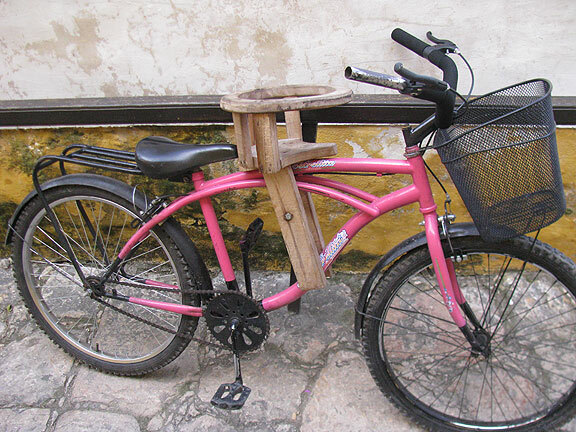 Check out the homemade child seat! 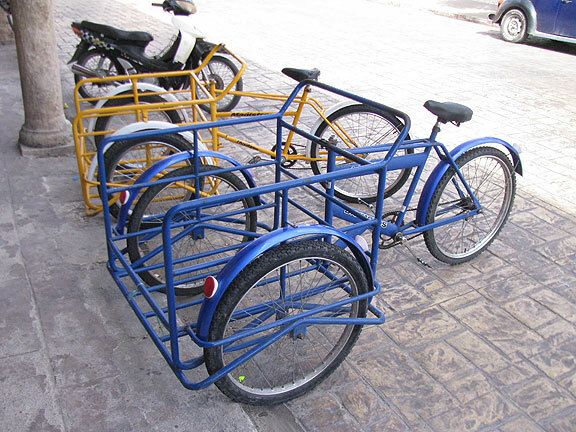 Sturdy freight bikes in Izamal. Adriana’s uncle Lorenzo and family generously loaned us a car (after the rental car reservation we made through Expedia turned out to be useless, being refused by EuropCar as invalid; and then we found out there were NO cars to be rented in the whole city for the rest of the week!) 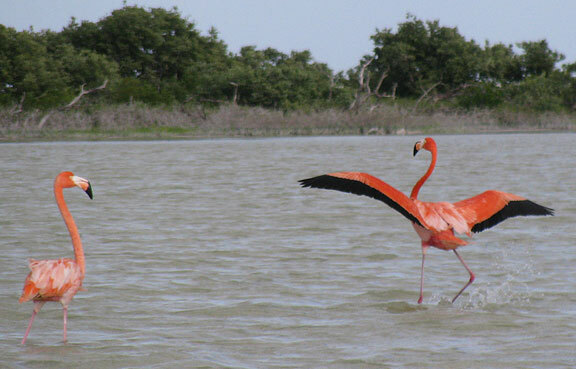 and gave us their beach house to stay in in Chicxulub (pronounced “cheek-shu-loob”). 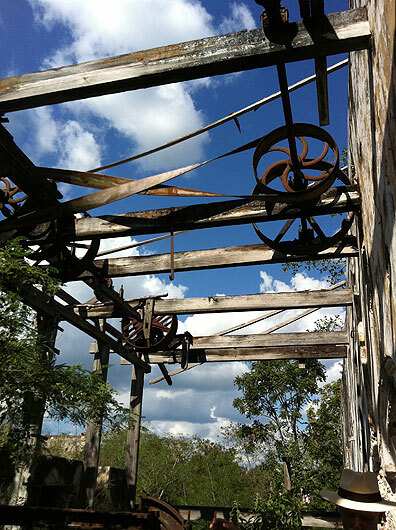 We began a series of day trips exploring the layered histories of the region. 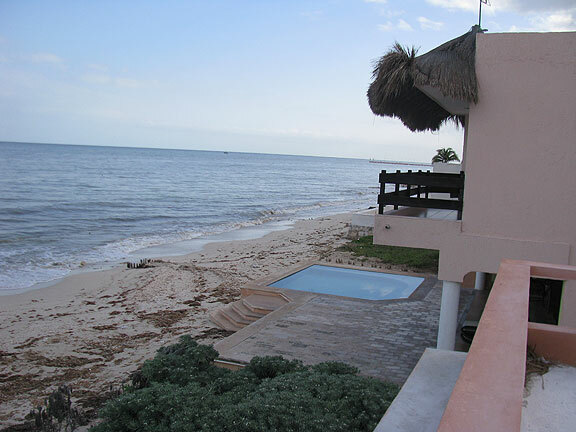 View from our terrace in Chicxulub, Yucatan, looking at the Gulf of Mexico. 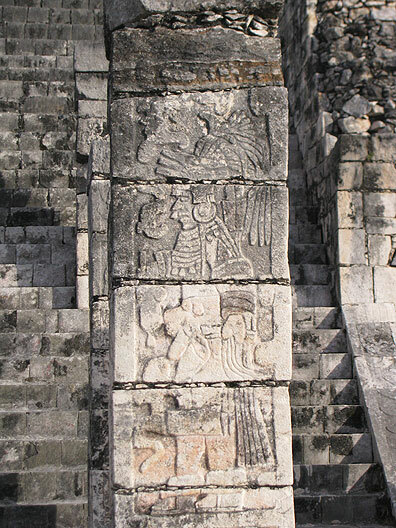 History is everywhere in the Yucatan, the Mayans being an obvious one. The Spanish conquest was completed in the mid-1500s, but the local indigenous resisted continuously. 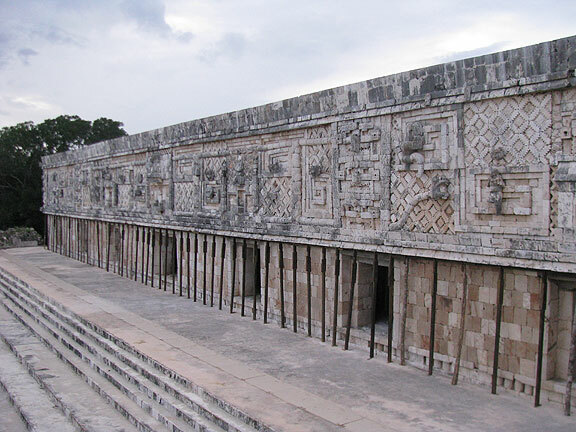 For a period after Mexican Independence in 1810, the Yucatan was an independent republic with the former Spanish colonialists holding power over the highly segregated population beneath them, at the bottom being the Mayan Indians who outnumbered the colonizers by three to one in the west of the peninsula and more than 5 to 1 in the east. In the 1840s various factions disputed power in the area, with two separate capitals being established in Campeche and Merida, and Indians being incorporated into the opposing armies. 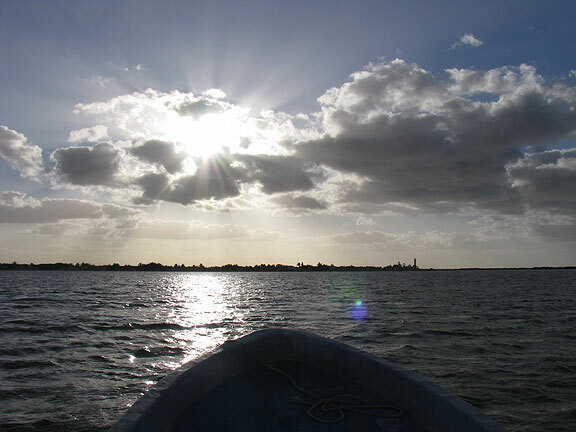 At one point some of the Yucatecan aristocracy tried to gain international support from the U.S. but eventually the region was reincorporated into the Mexican Republic. 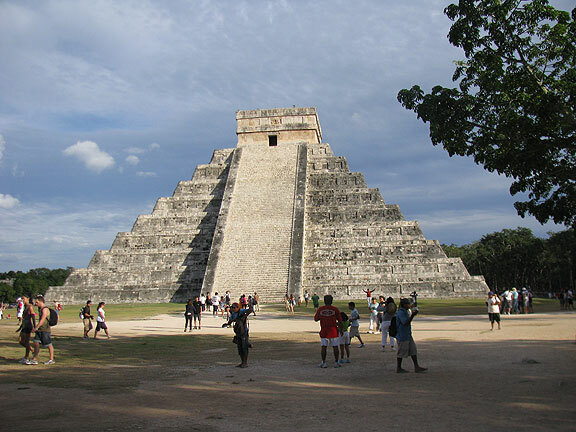 The Mayans, now armed, began to fight against the interlopers and by the 1880s had the two walled, capital cities under siege, and the rest of the peninsula under Mayan control. The Caste War, as this conflict is known, lasted from the 1840s until the early 1900s, and the last known military operation in the Yucatan against Mayan Indians wasn’t until 1933! Somehow no matter what we did, we arrived at the best known ruins near the end of the day, and had beautiful golden light, but also dusk-like light to deal with. 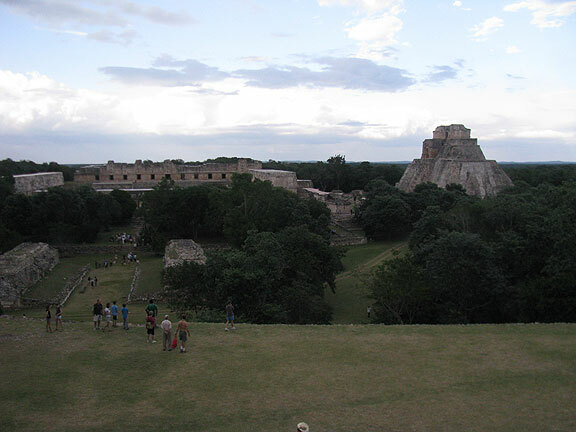 This is Uxmal from the top of one large ruin looking back at the iconic pyramid and the so-called "monastery". This remarkable wall is mostly restored, as it was in a bad state when first rediscovered in the 1840s. 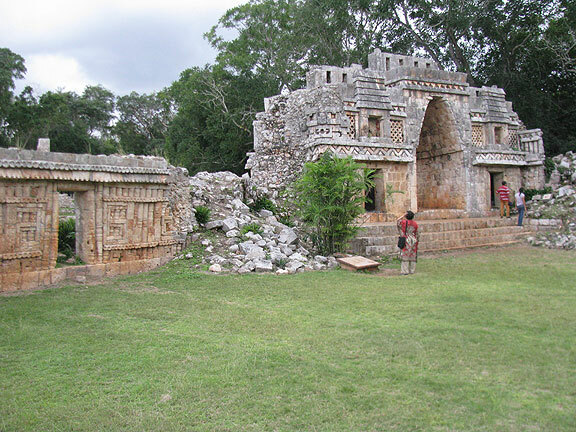 This wall stands alone in the jungle to the side of one of the major Uxmal pyramids. 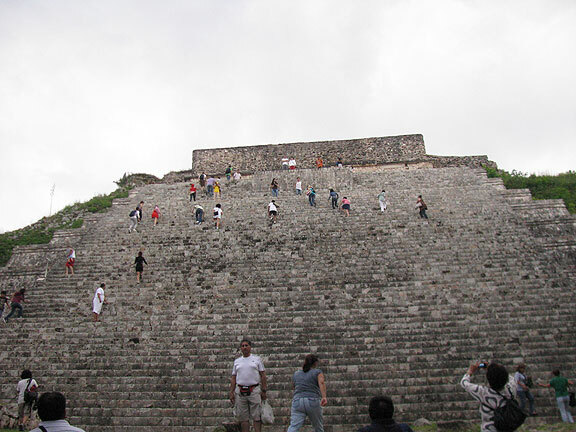 You were allowed to climb this one, and as you can see, it is quite steep! Coming down is harder than going up! 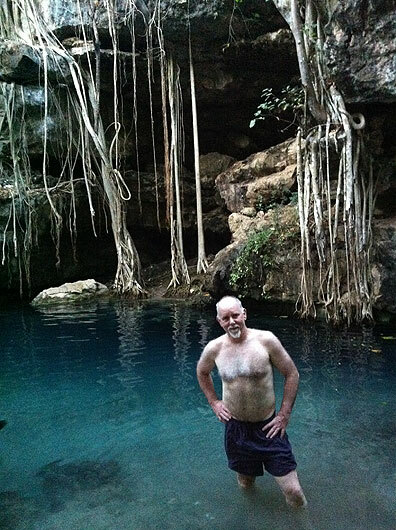 One day we went with Lorenzo to find cenotes (sinkholes) to swim in, and also to visit one of the old restored haciendas that dominated the local economy in the 19th and early 20th centuries. 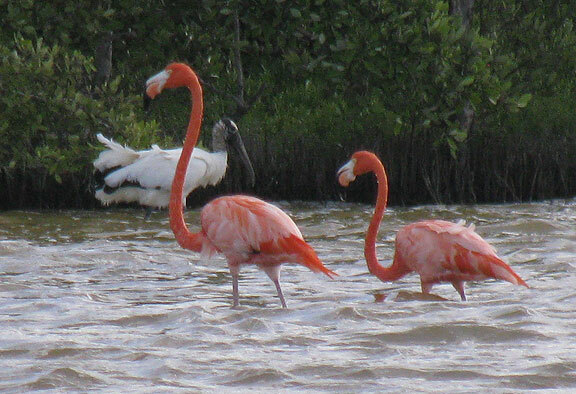 The Yucatan was responsible for 90% of world trade in henequen from 1880 to 1920, though it lost its pre-eminence long ago (today Brazil is the world’s biggest producer). Henequen, or Sisal, is a great source of rope and twine, and can be used in burlap bags and floor mats and many other industrial uses. These days they are beginning to find it useful as an ecological alternative to petrochemical-based fibers. 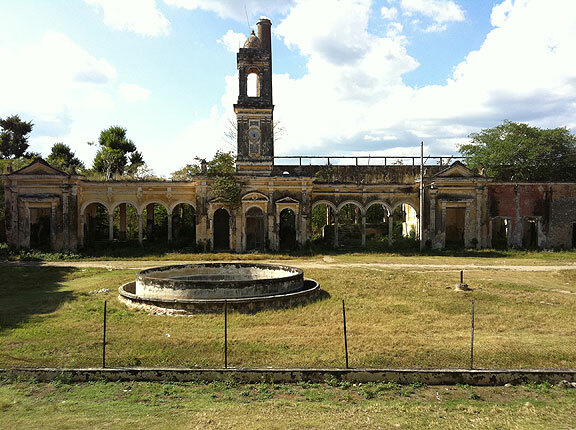 You can see how rich they were once upon a time when you come upon abandoned haciendas like the one we found in Uayacel. 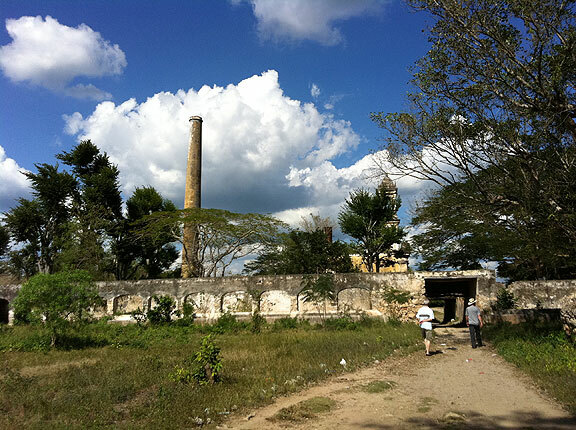 Some of the haciendas have been rediscovered by international investors determined to kickstart a local tourist business staying and eating at these once-again luxurious places. 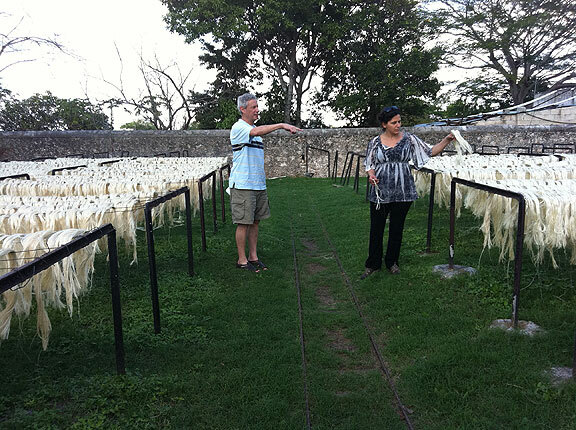 Lorenzo and Adriana amidst drying sisal, or henequen. 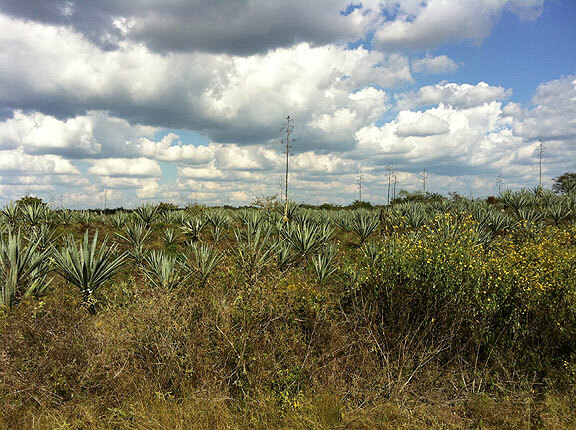 Henequen turns out to look a lot like agave, and is a close cousin, but rather than being used to make tequila like agave, it is a great source of the sisal fiber. The hacienda we were headed to was closed on January 1, so we kept going and found ourselves wandering through the ruins of an impressive hacienda in the small town of Uayalceh. 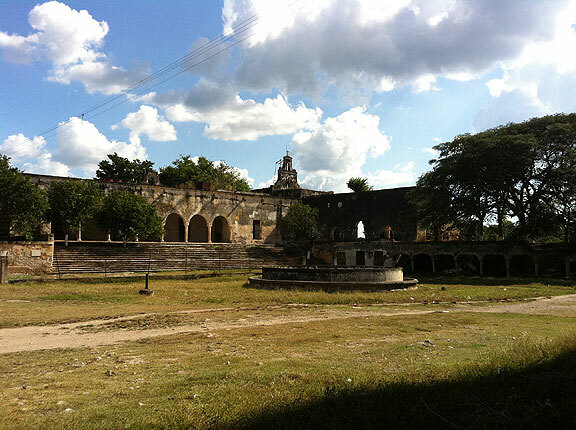 The abandoned hacienda at Uayacel, as we entered. 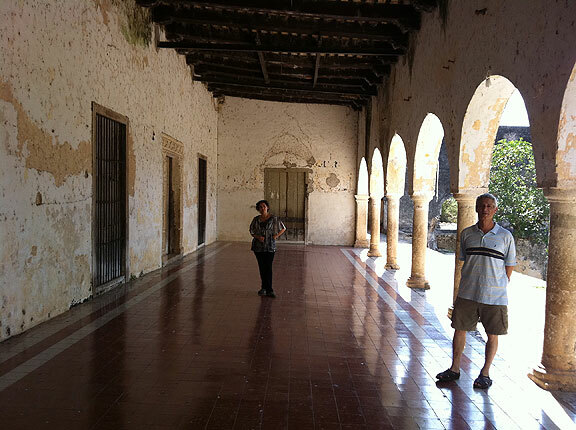 The inner courtyard at the hacienda at Uayacel, very European-influenced. Reverse view of same courtyard. Rusty remnants of old industrial equipment, most of the place had been completely stripped of anything useful. Gorgeous tiled outer corridor still being maintained by some locals who live in the dorm next to the adjacent chapel. Further meandering led us to a fantastic meal at Hacienda Ochil, where we enjoyed local specialties like Poc Chuc (grilled pork marinated in sour orange and pickled onions), Sopa de Lima (Chicken soup with limejuice),Papadzules (tacos with hard-boiled eggs, covered in pumpkin-seed salsa) and Cochinita Pibil (a stewed, marinated pork or chicken dish). Yucatecan cuisine is everything it’s said to be, and more! 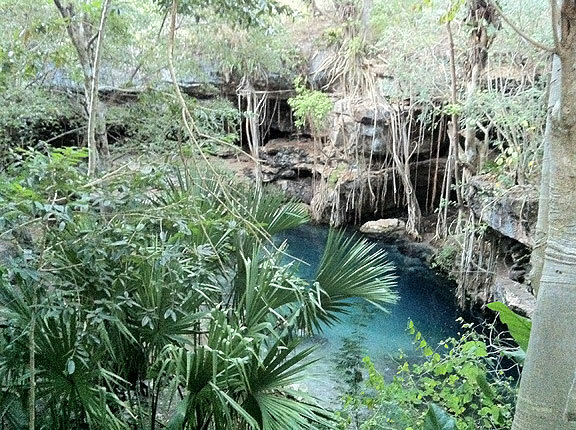 The open-air cenote we visited near Cacao. To all my skeptical friends: See, I did go in! 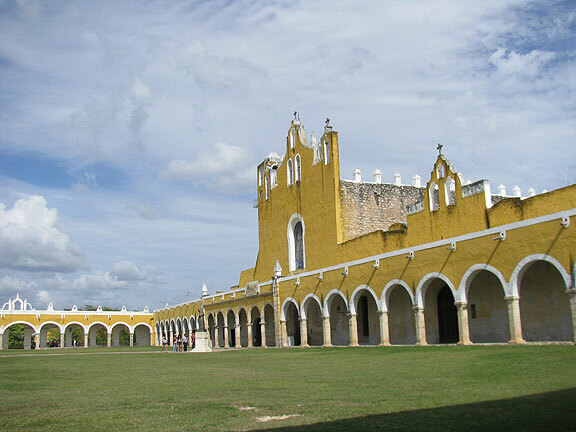 We went off for an overnight journey to top off our time in Yucatan, stopping first for lunch in Izamal, a beautiful colonial city where a huge convent is built on the ruins of an old Mayan temple. 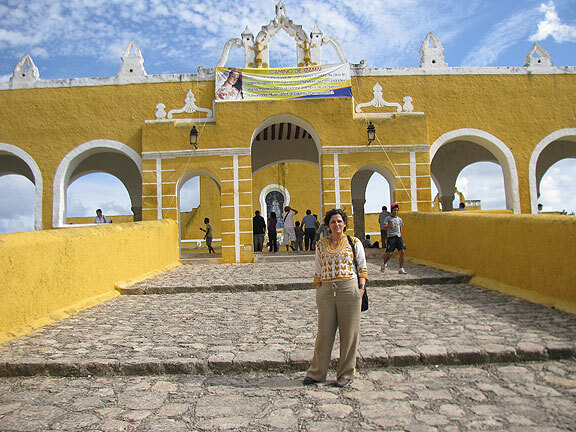 Ascending the ramp to the Convent in Izamal, built on the ruins of a massive Mayan pyramid. 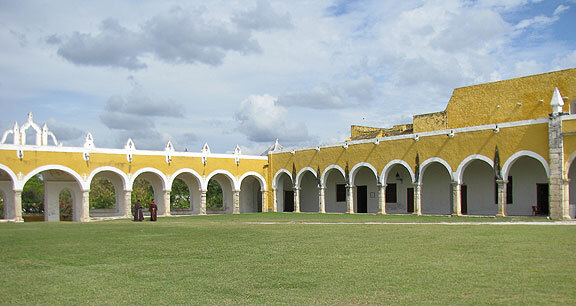 Three friars are entering the beautiful courtyard at the Izamal convent. The whole town is painted in this pretty yellow. After another great Yucatecan lunch, we made our way to Chichen-Itza, a “wonder of the world,” and unbelievably overrun with tourists and vendors of tschotskes. We arrived to wait in line to buy entry tickets for over a half hour, and then when we got in, after running a gauntlet of vendors we popped into the vast central plaza in which the iconic temple sits. Thousands of tourists milled about the plaza, it was like being in St. Marks Square in Venice! Dense crowds made it seem a bit like Disneyland, like we were seeing a replica of the real thing. We made our way to the further reaches, trying to escape the crowds. There is no restriction on the vendors, so they are at your elbow throughout your visit, hawking their mawkish wares. In spite of the crowds and the vendors, which we could only laugh about, we had to admit it was still worth it to see Chichen in person. The Temple of the Warriors was particularly impressive, as were the ballcourts and the observatory. 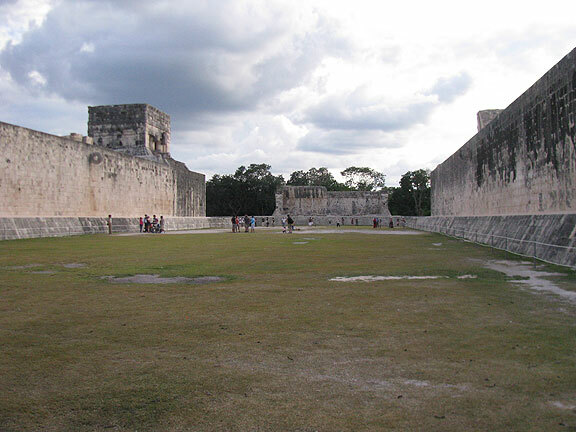 Everything is quite huge there, the ballcourt much larger than any one we’d seen before at Uxmal or anywhere else. The temple of the warriors, each column has its carvings representing warriors and their battles. Profile shot of the Warrior Temple. 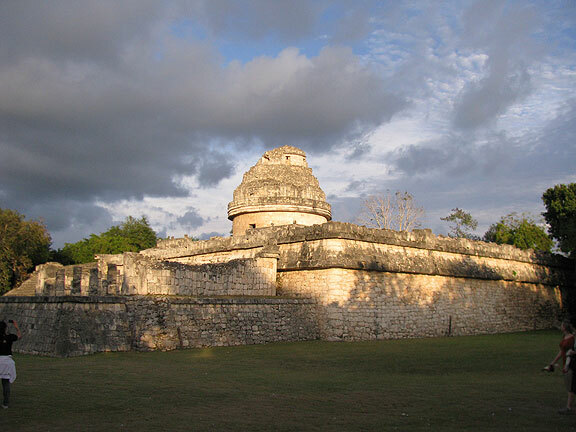 The famous observatory at Chichen-Itza. 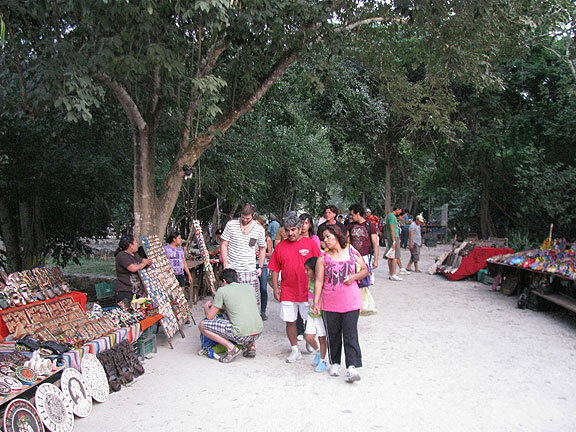 Incredibly, they allow hundreds of vendors of tourist schlock to line the paths throughout the archeological zone. 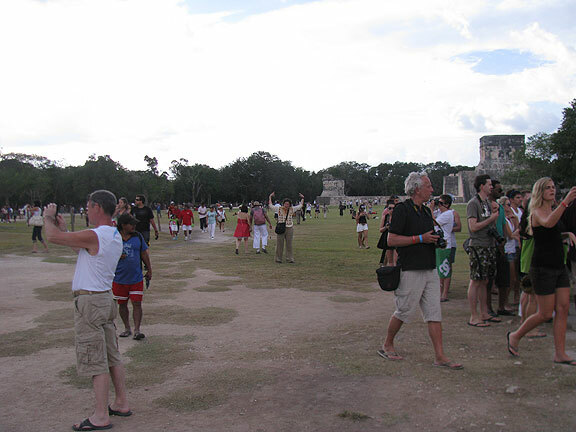 By far the largest ballcourts we saw at any Mayan site were here at Chichen-Itza, where they must have had their Super Bowl once upon a time. 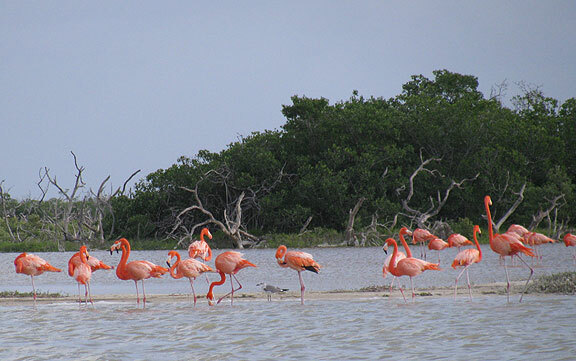 We spent the night in Valladolid, one of the larger cities in Yucatan, at a pleasant if pricey bed-and-breakfast owned by an American ex-pat, originally from North Dakota by way of New Jersey. 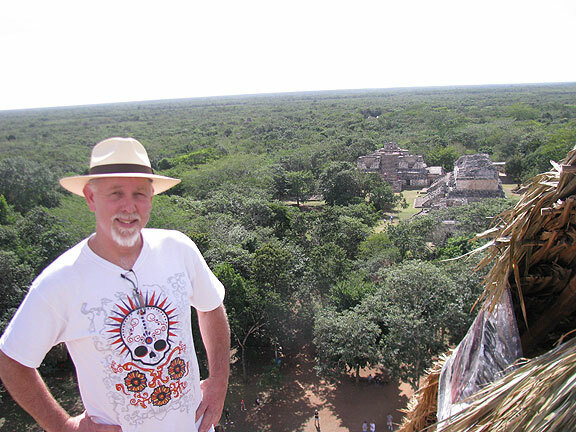 The next morning we went north to see the ruins at Ek-Balam, which had been highly recommended. Indeed, they are quite impressive. 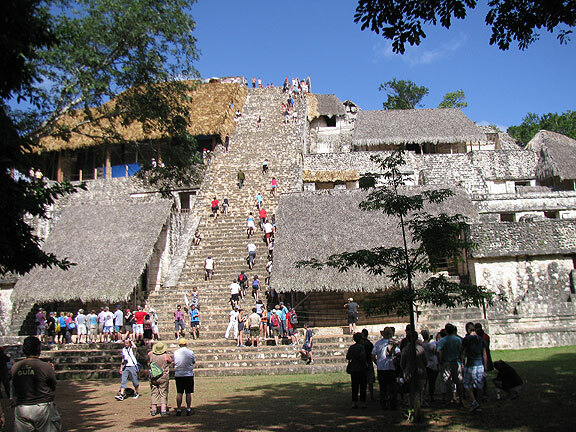 Massive structures, many still buried in the jungle, and a lot of restoration going on. 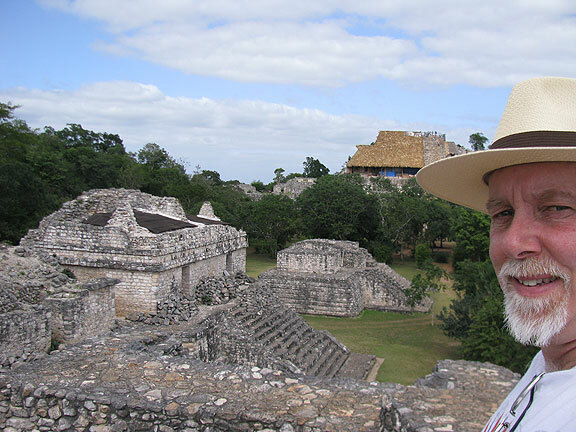 Here I am at Ek-Balam, looking back at the amazingly huge pyramid, which is undergoing a lot of restoration, hence the fresh thatched coverings. 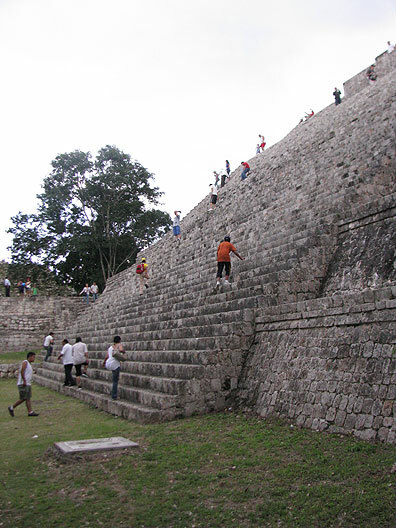 Another big climb up and down at the main pyramid at Ek-Balam. Great that you can still scale it! Those trees behind me hide an as-yet-unexcavated pyramid. 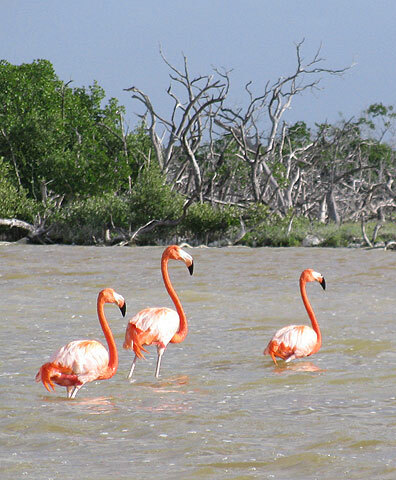 From there we headed to the north coast at Ria Lagartos, which was an important destination for Adriana, because her grandfather had filmed movies there in the 1940s, shooting beautiful early kodachrome of the flamingos in the wild. Now the sleepy fishing village at the north edge of the Yucatan is trying to attract an ecotourist crowd, but given the complete absence of tourist shops or souvenirs, I’m guessing that they’re not too successful. Mostly because it’s a very long drive to get there, some 50 km north of Tizimin, the last big town in the area, which is already a long way from everywhere else. It was a great experience! We got a launch for $75 for about 2.5 hours, and off we went. 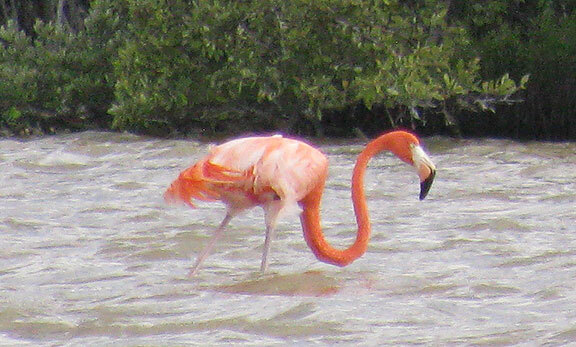 Our guide was quite knowledgeable and showed us crocodiles and countless birds. 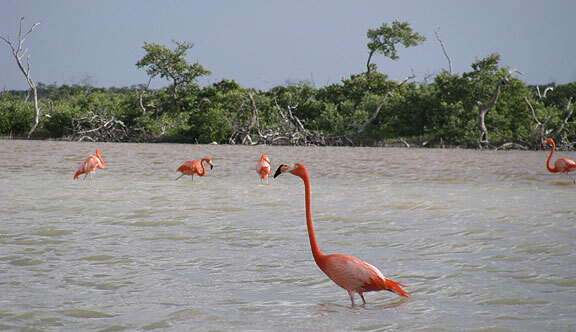 Over 350 species have been observed in this area, a major wintering roost for migratory birds, as well as year-round home to many charismatic shore birds, most especially including the flamingos! 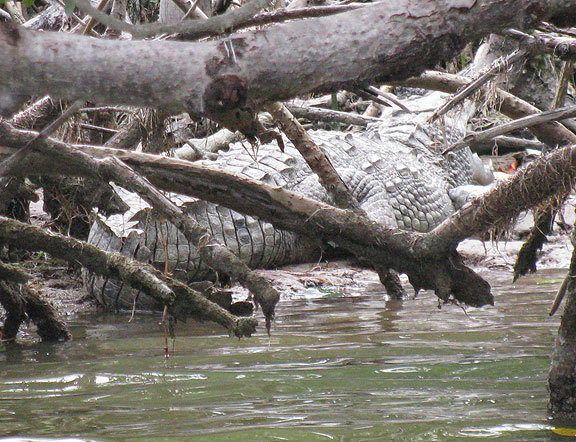 On our boat ride into the wetlands at Ria Lagartos we came upon this studly crocodile. 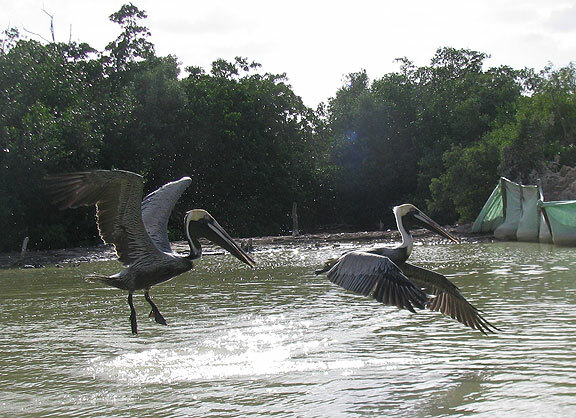 A second after this photo was taken it whirled around and lunged into the water, just beneath our launch! 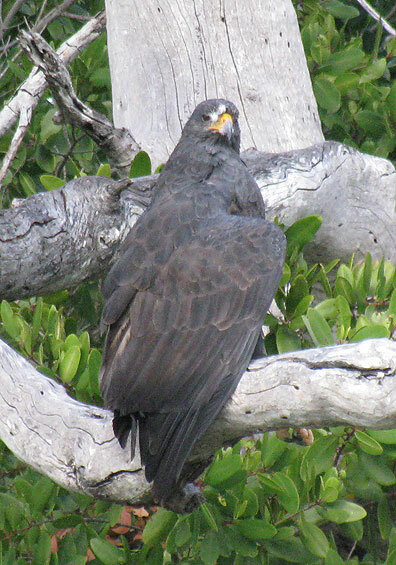 Black eagles were in great abundance, apparently all paired up in specific areas. This heron, not sure which particular variety, was quite a bit more shy, and moved away from us as we floated nearer to get a good view. 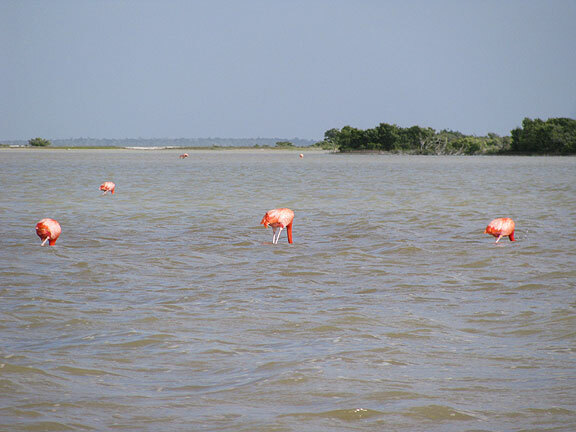 They would walk through the shallow water in perfect step. 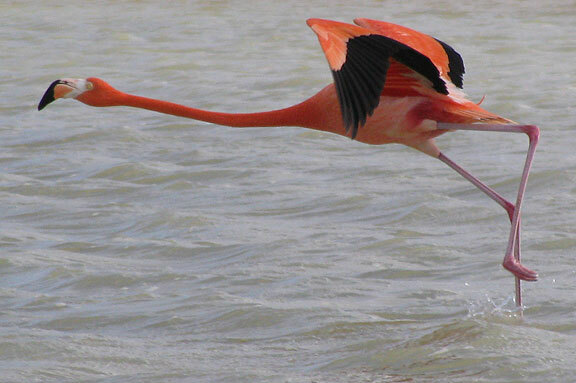 Finally it was time to go, and we headed back to Ria Lagartos. 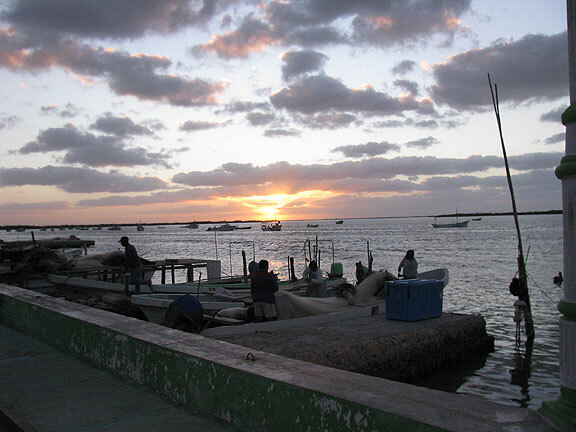 After a great fish dinner, sunset over the harbor, fishermen putting their nets away. It was a great visit! 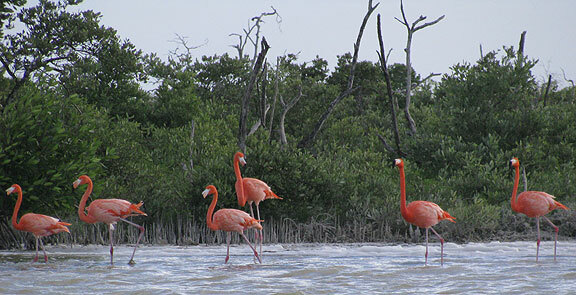 We felt we could have stayed another month and not seen all there is to see in Yucatan, so we’ll be going back for sure. Mexico is endlessly intriguing. Every part of the country has its own history, cultures, architecture, foods, and more. 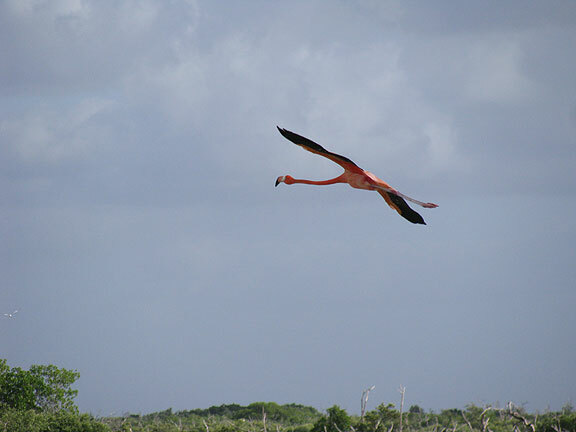 Visiting the Yucatan was a revelation! 1 comment to Getting a Head Start on the “End of the World”!